Wow. What can I say? I was really knocked back the other day when my friend Eileen, who I swear knows more about every different craft under the sun than anyone, picked me as one of the 7 Most Kreativ Bloggers she knows. 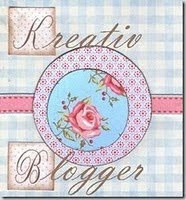 Eileen writes The Artful Crafter, and there just aren't any art forms I can think of that she's not willing to try! I guess that today I will tell you about the seven things you may not know. And maybe you don't want to know! That's ok...you don't need to read any further if you don't want to. This is personal stuff and doesn't really have anything to do with beads ;-) The rest of this week, I'll share with you the seven other bloggers that I'll give this award to. 1. I once ran across the Grand Canyon with my marathoning group, and I'm wondering if I will ever do anything that awesome ever ever again. Ever. 3. Italy was the most jaw-dropping place I've ever been. I didn't even want to go, really (I don't like being away from home), but it was so great I'm glad I went. 4. I love to read. That's probably why I became an English professor and later ended up working at the library. It was no fun working at the library...there was no time to read. So I decided to do art fulltime, and there's still no time to read. 5. I fantasize about owning dogs again. I miss having a dog or two. But I realize how much work they are and that I'm not in a position right now to give them that time and attention they need. 6. I love God. I mean, I'm just totally crazy about Him. I know that I only love Him because He loved me first, which means my love isn't as perfect as His. But I really am nuts about Him. 7. I love my family. Ok, maybe that's not a real big surprise, but I also LIKE all of them. I've got the best husband, son, daughter, daugher-in-law, grandbaby, mother, father, brother, inlaws, nieces and nephews that anyone could ever have. Hi, Congrats on your Kreativ Award! Wow, you went to Italy, I'll bet it was amazing there! I also bought a ole fixer up home 4 years ago and guess what, it still needs fixing up! lol But it's home and I love it! Congrats to you again! I hope that you have a beautiful new week! Thank Bobbi! Well, I'm absolutely sure that your family is the best too ;-) That's the nice thing about families...we can *all* have the best! Hi Cyndi-congratulations on your well deserved Kreativ award!